A 'gomukhi' is a special cover made in the shape of a cow's mouth. It is mentioned in our ancient texts that while chanting mantras on a rosary it should always be kept inside the gomukhi bag. 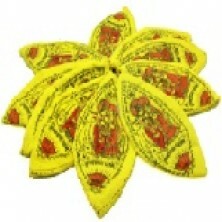 This gomukhi is made of cotton and has the sacred symbol 'Vrindavan Dham - Hare Ram Hare Ram, Ram Ram Hare Hare - Hare Krishna Hare Krishna, Krishna Krishna Hare Hare' printed on it. Colours Available - Lemon Yellow and Dark Orange.